The fashion world now has a new ace up its sleeve in the world of mobile marketing. In addition to signing up for your favorite social networks like Google+, YouTube, Twitter and Stumble Upon, the new must have for brands and fashion companies is appsbar.com, the free app maker. You may sign up and create a mobile phone app free of charge that ties together all your social media accounts and a whole lot more in one simple to navigate smart phone and tablet app. Our unique app creator was developed for anyone to create a native Google Play app and a HTML5 app that works on Android, iPhone, Windows phone and Blackberry devices. Join more than 125,000 individuals and companies that have signed up to create free apps. There is no experience necessary and no hidden fees. What normally takes months and thousands of dollars to build, can now be created in less than one hour for free with appsbar.com. We can not stress enough how easy we have made it to create an app and how effective it can be in engaging your audience. If you get stuck on any part of the process our friendly customer service is here to help you. Recently we have added a new app commerce feature that allows you to sell your latest styles through the app using PayPal. Visitors to your app can purchase your newest fashions without ever leaving the app. You may upload your wears and start your own smartphone and tablet boutique. We have designed a few pages for your fashion app to get started that are listed below and you may add or subtract pages as you see fit. You can fill out your information, including copy writing, pictures, videos and links that are relevant to your brand or company. Happy app making, we’ll see you on the runway. 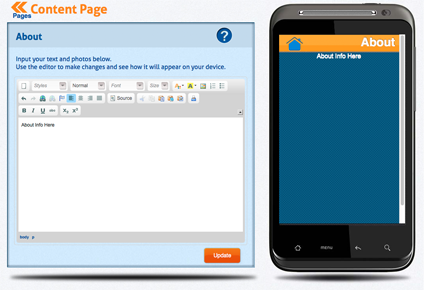 When you are learning how to make an app, you’ll see that the contact form is an easy way for visitors to reach you. 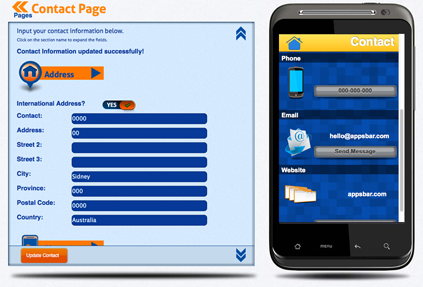 You can include your phone number, email, address and website. Your fans and customers will see your app daily when using their devices and will have easy access to contact you about new opportunities and questions about orders. It doesn’t get any sexier than mobile, allow your fans the opportunity to connect with your brand. 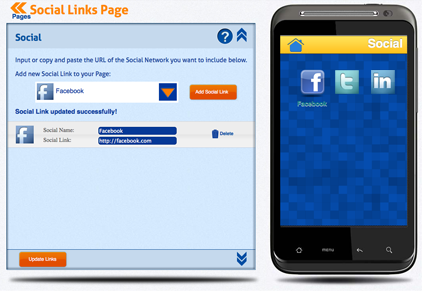 The social page is where you can insert all the URLs where you are located in the social web. Facebook, Twitter, YouTube and any additional places we can find your brand. Users will also be able to share pages of your app to their social networking accounts. We believe mobile is your most captive audience and now with the ease of our app making service mobile is as essential as social. It’s a free, easy to use natural extension of your clothing line and you can sell direct to consumers. The about page is where you can upload pictures and include text about yourself, your team and fashion brand. This page is similar to the same page on your website. Remember there is no knowledge of code necessary, all you have to do is fill in your text, photos, videos and links.